For those playing the at home game, according to an online police radio scanner, a “10-71” is the official code for a shooting. And we all know how accurate information can be from the internet, so who knows what that code really is for. Marianna Veronisci: "Alright boys, we got a report of a 10-71 off 4th & Jefferson." Tommy Gunn: "I hope thereís something left." Mickie Potatoes: "Worst case scenario, at least weíll get to stretch our legs!" Tommy Gunn: "Find anything worthwhile?" Mickie Potatoes: "Nope, just a couple of slugs left behind." Hello everyone, I want to zhow you my zarcasm detector. 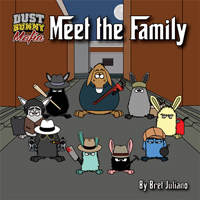 Well ya know I try to portray things semi-realistically…for a webcomic based around mafia dust bunnies and such. Some real mugs on those slugs!